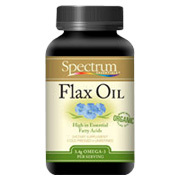 Organic Flax Oil Along with extra virgin olive oil and canola oil, Spectrum Essentials Organic Flax Oil is one of the “Big Three” oils we recommend that you incorporate into your diet. Each oil serves a different purpose. Organic Flax Oil is the richest vegetarian source of omega-3 essential fatty acids – nutrients that every cell in your body needs and that must be obtained through diet. Key Benefits A rich source of essential fatty acids necessary for everyday health and longevity, maintaining cell structure and producing energy The most concentrated vegetarian source of omega-3 fatty acids found in nature (about 50% omega-3) Source of important nutrients such as phytosterols and beta-sistosterin, as well as phospholipids, which aid in the digestion of fats Contains two times more omega-3 than fish oil at a fraction of the price Ounce per ounce, the absolute best omega-3 value on the market Unrefined, organically grown and processed SpectraVac Cold Pressed to protect oil from consequences of oxygen, light and heat Protectively packaged in 100% inert black plastic and hermetically sealed with an inner and outer closure Available in 8-, 16- and 24-oz. liquid and 100 count and 250 count 1,000mg softgels Why Flax Oil? There are about 50 essential elements our bodies require for everyday health and longevity. They are considered “essential” because our bodies cannot manufacture them; we must acquire them from the diet. Most of these essential elements are vitamins, minerals and amino acids, but two are the essential fatty acids known as omega-3 and omega-6. Omega-3 is regarded by many nutritionists and researchers as a leading therapeutic fatty acid because of its importance in aiding the body to maintain healthy cell structure, promote metabolic energy and enhance immune function. However, most of the population, (about 80%), is believed to be deficient in omega-3. Vegetarian flax oil is one of the richest sources of omega-3, containing twice the density found in salmon—a familiar source of omega-3. Flax is also rich in phospholipids, which form cell membranes, promote nerve insulation, and improve immunity. Flax also provides sterols, precursors to many hormonal constituents such as estrogen and testosterone. Nutritionists have reported that supplementation with flax may result in the following benefits: smoother skin, improved immunity, better energy/less fatigue, quicker wound healing, less anxiety or stress, improved hormonal regulation, lower cholesterol and triglyceride levels and many other health benefits. Because omega-3 is easily digested and put to work immediately when taken as directed, it does not convert to stored fat. Supplementation Recommendations Since most Americans suffer omega-3 deficiency, flax oil is the recommended starter oil for initial supplementation, providing the body with a 3:1 ratio of omega-3s to omega-6s. Supplement daily with 1 tablespoon per 100 lbs. of body weight. Flax oil is best taken with meals – especially protein sources. A competent health care practitioner can recommend the best therapeutic levels for you based on lifestyle and general health. Product Origin Flax seed, botanically called Linum usitatissimum, means “most useful plant” in Latin. Dating back to the ancient civilizations of the Middle East, is one of the oldest cultivated plants. Ancient people used the fiber to make linen clothing, the oil to light lamps as well as for culinary purposes. Tea was made from the flax roots. Our seed is grown organically along the USA/Canada border. Flax needs long cold winters and short hot summers with long days of sunlight to generate the high ratio of omega-3 fatty acids that make it such a dense source of EFAs. The states and provinces of North Dakota, Minnesota, Montana, Manitoba, Saskatchewan and Alberta with their black, fertile soils are the prime growing regions and deliver a very potent form of flax oil. SpectraVac Process. Flax oil is an extremely delicate oil that deteriorates easily if not specially processed and handled. An exclusive Spectrum process, SpectraVac is a highly evolved method that extracts oil at cold pressing temperatures (under 120° F) and prevents the destructive effects of light, heat, and oxygen. SpectraVac also eliminates soil-born bacteria called mycobacteria thus insuring a level of purity and food safety that no other manufacturer has been able to achieve. Two to six capsules with each meal. Optimal daily Dosage: 1 tbsp. per 100 lbs. Body weight (14 capsules+ 1 tbsp. oil).